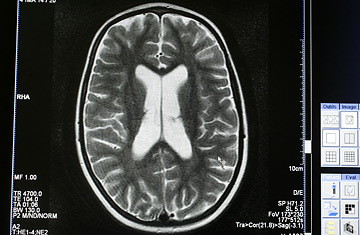 A scan of a brain. Sam Harris is best known for his barn-burning 2004 attack on religion, The End of Faith, which spent 33 weeks on the New York Times best-seller List. The book's sequel, Letter to a Christian Nation also came out in editions totalling hundreds of thousands. Last Monday, however, the combative Californian produced a shorter (seven pages) and seemingly calmer publication that will be a hit if it reaches 10,000 readers: "Functional Neuroimaging of Belief, Disbelief and Uncertainty." It appears in the respected journal Annals of Neurology. And Harris, 40, claims it has little if any connection to his two popular books. Believers, however, may draw their own conclusions  and may want to read his subsequent neurological studies even more carefully. The current paper recovers Harris's identity as a doctoral candidate in neuroscience at UCLA, his occupation before he commenced what he calls his "extramural affair jumping into trenches in the culture wars." It is an addition to the growing field of brain scan trials, and Harris thinks it may be the first to detail how the brain processes belief. At first read, it seems less dangerous to Christianity than to another cherished pillar of Western thought  that "objective" beliefs like "2 + 2 = 4" and "subjective" beliefs like "torture is bad" belong to entirely separate categories of thought. Is there a practical application here? He speculates that if belief brain scanning were sufficiently refined it could act as an accurate lie detector and help control for the placebo effect in drug design. Harris says there is no critique of faith hidden somewhere in his brief paper. But his next neurological enterprise may be another matter. He is planning an fMRI run that will concentrate specifically on religious faith, which Harris thinks he now knows how to plumb more deeply. He also plans to set up two different subject groups  the faithful and non-believers. "That way," among other things, he says, "you can ask, 'Do believers believe that Jesus was born of a virgin the same way that nonbelievers believe that Chevrolet makes cars and trucks?'" It may turn out that the brain treats religious faith as its own special category of belief unlike ethics and math. But that is not what Harris expects to find. He suspects the machines will show that "belief is belief is belief." And that conclusion, he admits, may put him at loggerheads with familiar foes. No one, he says, could accuse him or anyone else of trying to disprove God's existence on the basis of an fMRI. But faith is more vulnerable. "People who feel that religious faith is a singular operation of the brain  if they admit that it's an operation of the brain at all  would object to what I'm doing, since it may show that faith is essentially the same as other kinds of knowing or thinking. The whole thing will seem fishy to anyone who thinks we have immaterial souls running around in our bodies." Which, of course, a lot of people do. And despite the fact that, as Harris puts it, his current literary mode "is not beach reading," they may find that they are keeping up with his academic writings more avidly  and nervously  than they do his bestsellers.